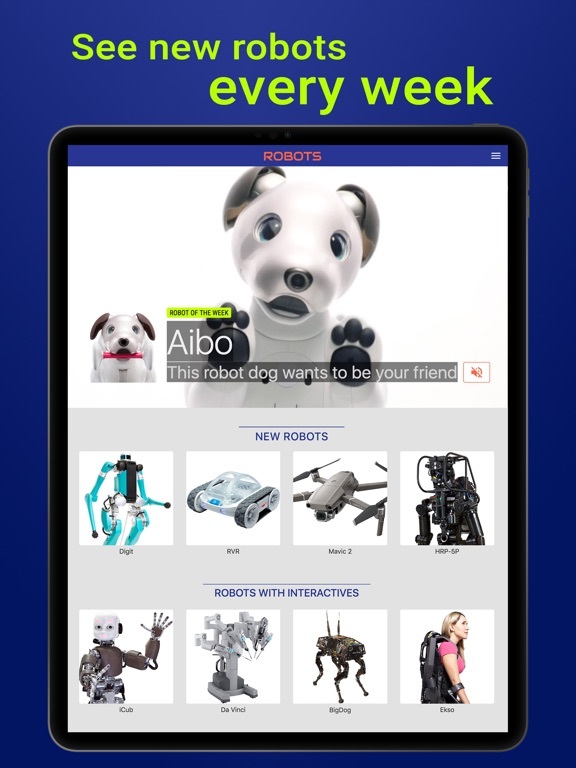 Robots for iPad is an amazing app that is a good fit for families or schools. Spend hours browsing interesting facts, viewing the many photos and videos and more. It will open your eyes to the wonders of robotics. 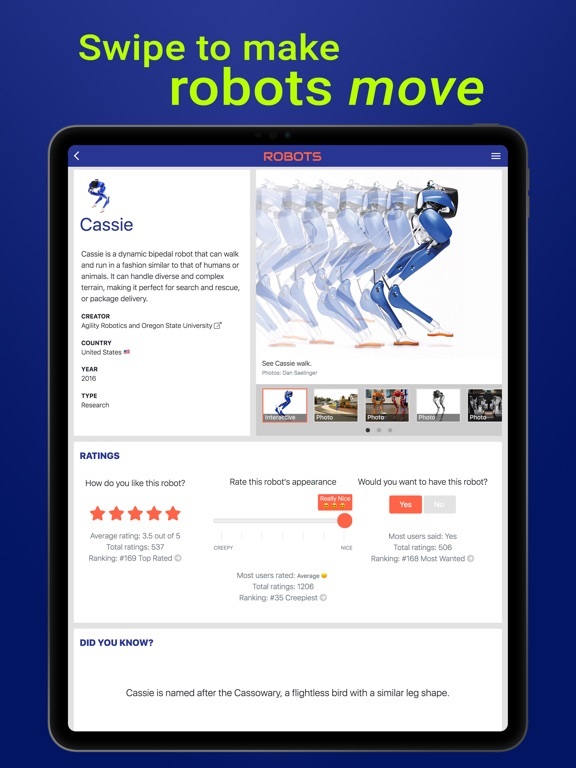 Robots for iPad is an exceptional app. The developers have combined a number of design elements to make it easy and enjoyable to navigate the huge amount of content. There is a good mix of text, photos, videos and activities. The app is broken into different sections making it less overwhelming to use. 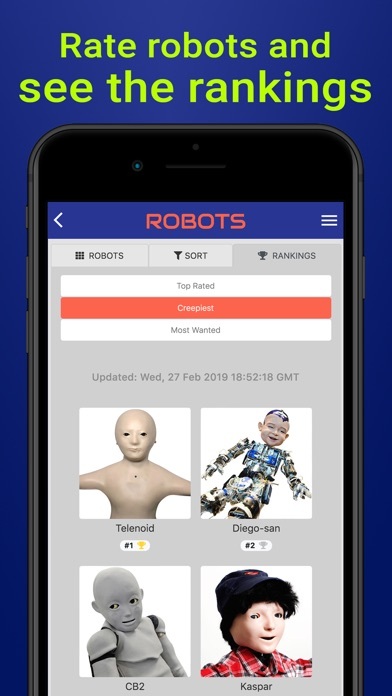 The app is broken into different sections; such as Robots, Ratings, News, Play, Learn and About. 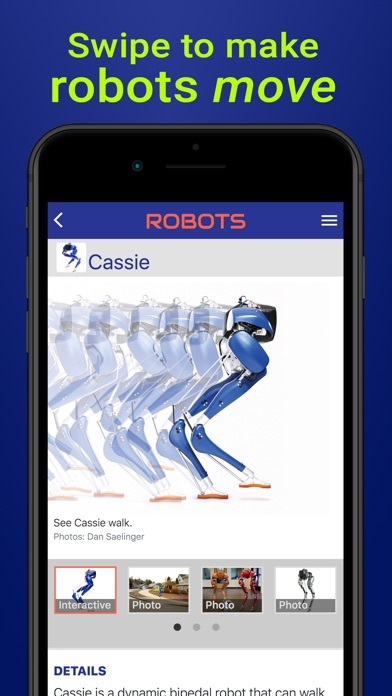 In the Robots section, peruse through featured robots, which have 360 degree views and interactive images, all robots, robots you’ve added to your favorites list, or random robots. 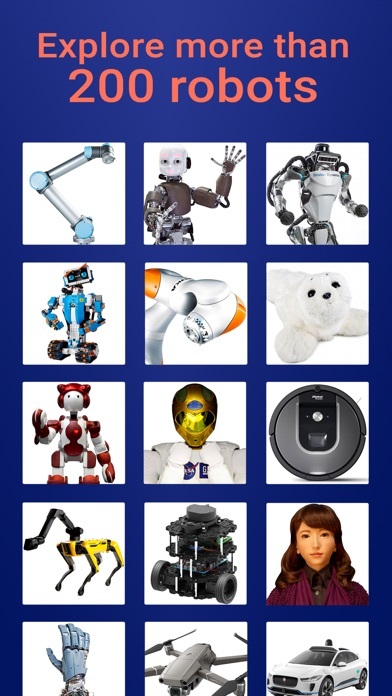 The user can also sort robots by type, country, date or size. 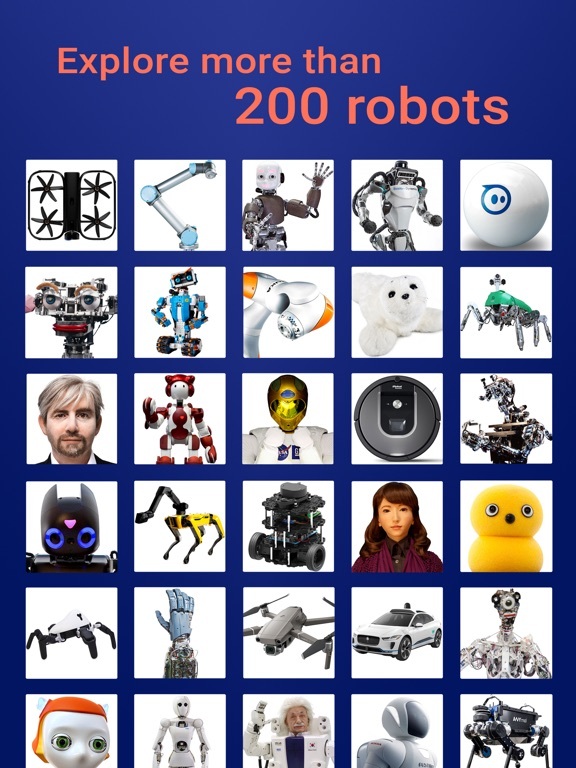 For each robot, learn the creator, location, year, type, details, and specifications and read related articles and see which other robots are similar. Ratings are a fun way to look at the robots based on how other users have ranked them. There are top rated robots, most wanted robots and creepiest to nicest. 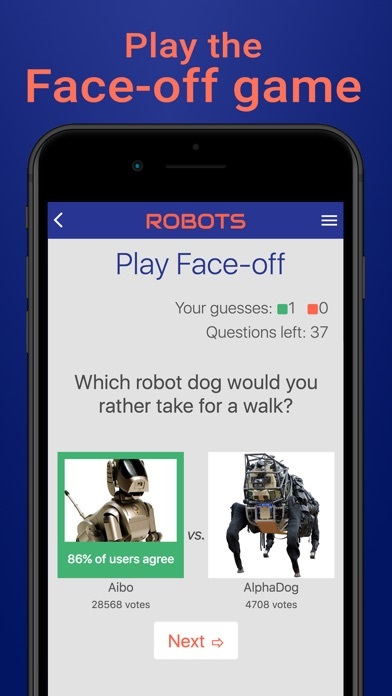 Ranking robots is done from within the app and is a favorite feature of my family. Robot News is where the user will find news and feature articles from IEEE Spectrum updated daily. IEEE is the Institute of Electrical and Electronics Engineers. Another family favorite is the Play Face Off section. The user is presented with two similar robots at a time. Choose the one that answers the question and then see how other users are answering the same questions. 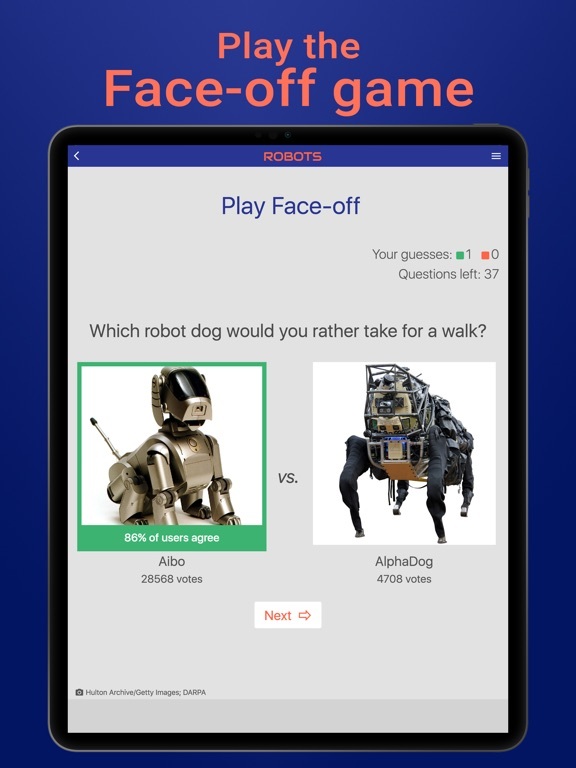 Questions such as which robot you would rather hug, which sci-fi robot is cooler, or which one is the robot when presented with a humanoid and the real human. You will be surprised how real some of the humanoids actually look! Learn is a section about robots in general; such as definitions of robots, getting started in robotics and to learn more, check out the Timeline of Robotics. It amazed me to learn that in a 1495 sketchbook of Leonardo da Vinci’s a mechanical automation in the form of a suit of armor was found. A Glossary of Robotics Terms is also included. This app gets high marks in the entertainment area. Yes, this app is highly educational, but to see my family spend hours with this app surprised me a bit. I knew they would like it, but for it to become the “go to” app when the kids have free time on the iPad is what surprised me. They are sketching their ideas on paper and using another app to create their own robots. This exceptional app, with its high quality design, tons of educational content and high marks in the entertainment area, is a great value. 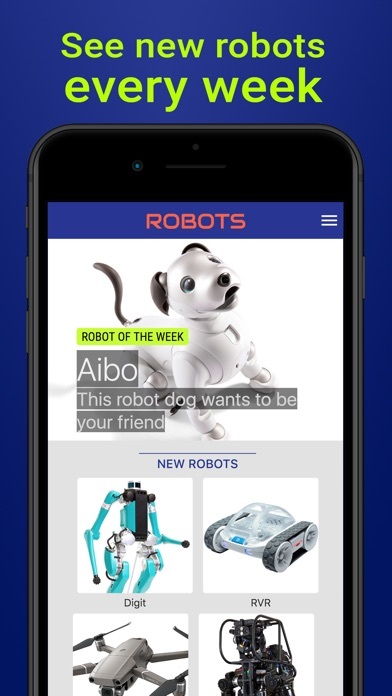 This app is intended for kids age 9 and older, because some of the robots may scare younger children. The age suggestion is also good due to the amount of reading and possible access to external links. External links and social media buttons are found in the app, but are not in your face, popping up in unwanted places or disrupting use of the app. The app does not contain ads or in-app purchases. An internet connection is needed to view much of the app.